Shimmering, calving, evolving. A new art project seeks to connect people with the climate change surrounding them. By Chen Li, all rights reserved. Catch, drive, recover... catch, drive, recover... catch, drive, recover. Feathered blades, butterflies and my gaze flickering over the shimmering Danube. The story of Polar self Portraits starts years ago, during never-ending, sizzling summers of rowing on the Danube. Some of this rowing includes coping with high water levels. Floating over spiky wrought iron fence. This did not dissuade us from rowing. The Danube may look dark, murky and confused but I embrace its anger, and dive into the agitated foams. Grab the nose of the boat and flutter-kick my way above the spikes of the iron fence, dragging the boat behind me. Park it by a boathouse along the stretch of riverbank called Római-part, after its ancient Roman inhabitants, also fans of all things to do with water. Fast forward. To another water experience, which links in my mind with the flooding Danube. Different maybe, but just as deeply imprinted in my visual memory. A different place, a different time, and, yes, rather different temperatures. The high Arctic waters leave a different mark, yet whenever I am asked why I wanted to go on such an expedition, I tend to think of my dive into the foaming vortex of the flooding Danube. The Arctic expedition’s inflatable life raft leaves me ashore on a small, rocky island to install a land art project. As I am working, I’m aware of an enormous glacier looming over me. The floating highways I am creating on the shimmering, calm water surface seem to reach out effortlessly to the glacier. The intensity of the silence is loud. How palpable and penetrating silence can be. I listen again. Is that a blast? Something certainly shatters the air. By Michelle Dawson, all rights reserved. I think one of the most evocative images of the repercussions of climate change for me has been photographs of the lone polar bear marooned on an iceberg, caught out by the warming sea temperatures and therefore cut adrift in the middle of the ocean on an ever diminishing iceberg. As such my intention was to convey that I would, if I could, afford them sanctuary. But the other component of the challenge was a self portrait, and I didn’t realise until I had completed the work, that this piece is also about the bereavement I have experienced this year, the sense of loss, aloneness and being emotionally frozen that has occurred as a result. So unexpectedly and unbidden it is almost as if the bear is concerned for my well being in the resulting image. I do not know what to make of this, except that it is the nature of art to show us inexplicable things. The shimmering water surface shatters. Waves approach me, bigger and faster by the second. The seemingly sleepy glacier is calving. The water surface crunches and swallows my installation. Changing gear from awe to survival is in order. At my feet, the red waterproof covers for the guns – a mandatory fashion accessory up there to keep polar bears away – are already washing away with the waves triggered by the iceberg falling into the sea. Even though the glacier only speaks for a few minutes, it leaves an energising imprint on thinking, dreams, creative processes. Nothing should be left behind in the Arctic. Art materials are also pollutants of the Arctic sea. On autopilot, I stumble across the sharp rocks, wading into the waves to retrieve the disfigured pieces of my land art installation. I stumble back to shore, climb back on the slippery, steep rocks. Breathless. The water starts to regain its shimmering face. The silence is palpable again. The shore looks the same, the sea sounds the same, the sharp air tastes the same. But the awe is dramatically different. It is deepened by a cathartic cocktail of understanding, stirred by uneven heartbeat, spiced up by an appropriate degree of fear. This texture of feelings, images, thoughts continue to reverberate. Even though the glacier only speaks back for a few minutes, it leaves an energising imprint on thinking, dreams, creative processes, choices, decisions and projects. The raw intimacy and immediacy of those moments of the glacier talking back and diving in the foaming Danube connect. This synergy continues to resonate in art projects, such as Polar self Portraits – the artist and the curious case of the vanishing ice caps. The artist and the curious case of the vanishing icecaps takes us on a expedition to consider the dynamics between the (perceived) centrality of the self and the (perceived) peripheries of the planet, the polar regions – and creates connections between them. This visual (and, implicitly, also emotional and intellectual) expedition explores the relationship of two iconic art genres: the landscape of the face – the self-portrait – and the face of the land, aka the landscape. How can we re-imagine the boundaries of classical genres in the context of climate change? Given the urgency and relevance of this issue, I have opened up the Polar self Portrait project to artists and organisations internationally. Artists from six continents have created their interpretation of this question. Google’s headquarters in New York, the Royal Institution and UCL in England, and an art festival in the centre of France welcomed audiences to look at some of the work. Some of photographs I took during the Arctic expedition reached fine art photography readers through Adore Noir. 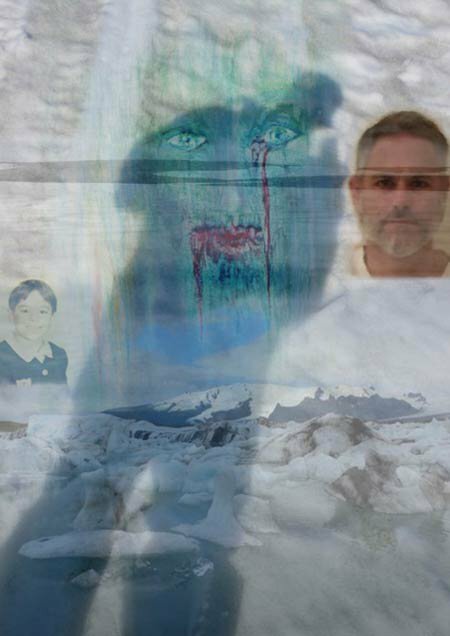 And then there is the digital edition of this project for the digital age we live in: Polar self Portraits, the film. It has engaged audiences in an art museum in Greenland, scientists in the research stations of the British Antarctic Surveys, several universities in the Balkans, a contemporary art gallery in Morocco, and in Washington. In New York, C4: The Choral Composer/Conductor Collective screens the film in their concert series ‘Visual’. There climate change through art is in interplay with contemporary music making. Manhattan concert goers tend to be receptive to such things, but how to engage audiences not necessarily and regularly nourished by contemporary art and music? We live in the age of the obsessive, not to say manic, clicking of posed selfies. People die (literally) for a selfie. How could this narcissistic interest in the self in specific contexts benefit creativity and learning about art, climate change, and yes, the self? This is the question behind the series of drawing workshops Polar self Portraits – another series of public engagements about climate change through art. How is it possible to involve passers-by in art and induce them to engage with climate change in a creative and unexpected way? Some of the contexts in which this challenge has played out include the weekly market in Fleetwood, the garden of the Red Lion Inn and Pub in Hawkshead, and a library, art museum and pizza place in London. Polar self Portraits has also taken place in various museums, including the Fleetwood, The Ruskin and The Wordsworth Museum. By Ikbale Kalaja, all rights reserved. A major problem has hit our Earth, and with it, us too. Global warming has brought climate change and it is destroying all life balances. Ices are melting and they have flooded the earth. Arctic icebergs are having their own metamorphosis. Which will be our metamorphosis? Taking a selfie each time eases us into the creative process. And then actually looking at it, analysing what we see takes us deeper. And before we notice, we are way beyond the familiar and high-comfort-factor selfies, and deep into the exciting, unchartered territories of drawing human features and proportions. Only through re-imagining the landscape of the self-portrait have we learnt to layer the self and polar landscape together. It’s a challenging expedition, to get from a posed selfie to a polar self-portrait – and to end up as the self merged with the polar landscape. “This drawing workshop has taught me … to be brave”, said one of the participants at the Ruskin Museum, a male teacher in his mid-30s. Waters shimmer; glaciers calve; ideas evolve. How could this narcissistic interest in the self(ie) benefit learning about art, climate change, and yes, the self? 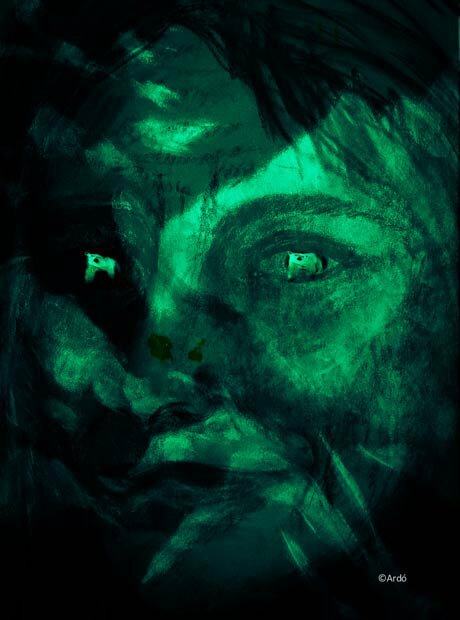 Zsuzsanna's face becomes the polar landscape, and the bears set forth from her pupils. Painting by author, all rights reserved. My research of the tradition of the artist’s self portrait continues to wash over me. It continues to deposit a string of gazes in me, including the self-portraits along the Vasari corridor or in the Musée d’Orsay. At some point I realised that my polar self-portrait would have to be about the gaze. My gaze, in the face of the polar landscape. The face of the landscape found its place in my face. 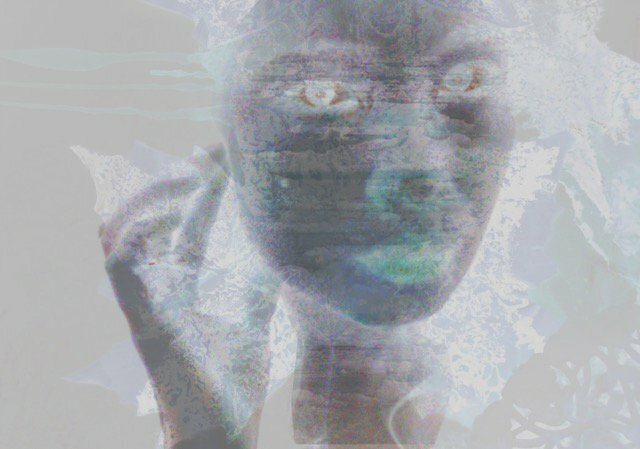 The landscape of my face became the face of the polar landscape, polar bears roaming from my eye sockets. As a curator of this project, I have been curious to see how the artists I invite interpret the theme. Will polar bears perhaps become a recurring theme? Well, no… not a theme; perhaps a presence. An artist from Italy swims with polar bears. Another artist from Croatia includes one in her collage. 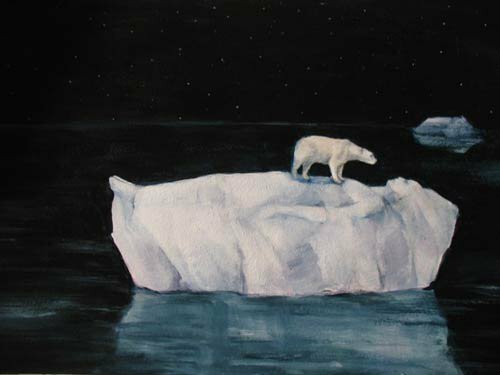 Yet another artist from Australia creates a dramatic encounter between herself as a frozen iceberg floating in the dark Arctic, with only a polar bear standing on her iceberg chest. A polar bear, curiously engaged with her face, standing on her frozen iceberg body. And a polar bear inside my skull, gazing back at the viewer from my eye sockets. 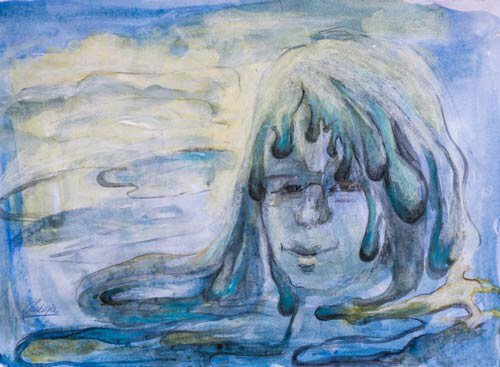 Polar self Portraits, climate change through art, has been an interplay many different treads, including the Danube, the glacial morphology of England and the Hudson Valley, land art creation in the High Arctic. Art and ideas, like glaciers, shimmer, calve and evolve, and engage people in England and beyond. By Ralph G. Brancaccio, all rights reserved. It is great to support belief-systems curbing climate change, but oftentimes, people are oblivious to their behaviour, which grossly contradicts what they believe. And this is heartbreaking. Since childhood, I put forth effort supporting a common good and through my art practice I hope to enlighten. My image reflects on a timeline between my youth and today. It evokes my emotional state as you go from the innocence of a child to seeing the reality we face today as we foolishly lose our polar environments to rapid climate change.